You know you have seen your iPhone friends use them and that you were at the very least, a little jelly. I’m talking about those little attachable lens kits that fit perfectly on the back of their bent carefully crafted, aluminum phones, that take super fun fish-eye party pics. Well, we have them over at the DL Deals shop for just $24.99, in a package that includes fish-eye, wide angle, and macro lenses. That’s not a bad price, as similar bundles typically run anywhere from $49 to $69 depending on the retailer. So how do lens kits work? In the box, you get your lenses, but you also get magnetic rings that attach to your phone via adhesive. With these rings stuck to your phone, around your camera lens, you can magnetically hot-swap the lenses depending on the type of photo you are looking to capture (macro, fisheye, or wide angle). Make sense? Attach magnetic ring to phone, around camera lens. Attach lenses to magnetic rings. Take pictures. It’s that simple. So will they fit on your phone? Good question. 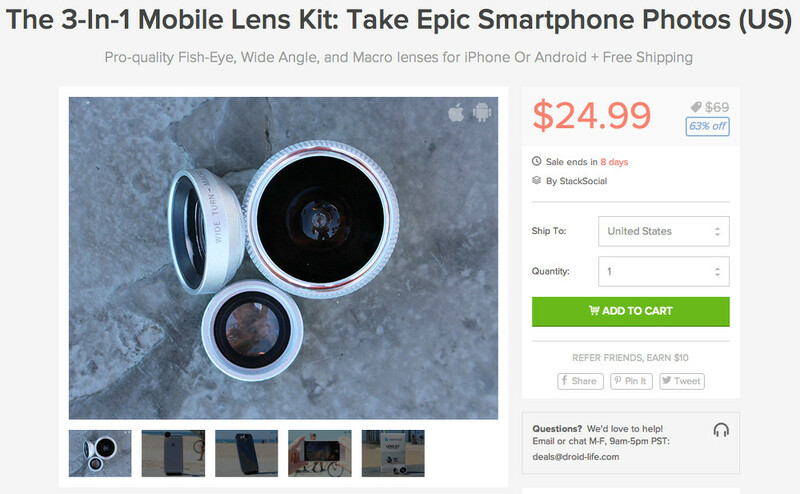 As I mentioned, these lenses were made perfectly for iPhones, but they also work on a variety of Android phones, including the Nexus 5, Galaxy S5 and S4. But, to make sure, you need to measure the diameter of your phone’s camera lens, then refer to the measurements below to see if it will fit. Lens size? – Lens diameter ranges from 16mm to 25mm and 6.5mm to 10mm in height. Ring size? – The rings are 13.06mm (outer) and 9.38mm (inner). If your phone’s lens has a smaller diameter, it’ll work perfectly. Also, you can head over to the deal link below, run through the comments to double check, and even ask a support expert if your phone is compatible. Ready to take some lens kit pics? The time is now.